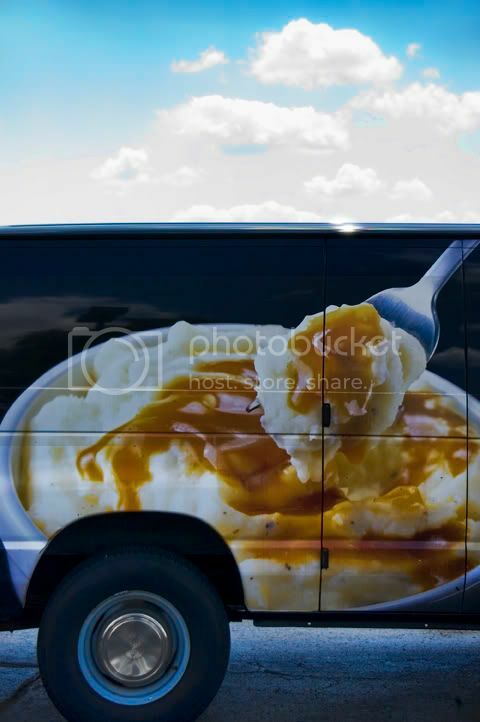 There's really not a lot to say about this picture, except that the clouds could use some gravy. I love recording this kind of stuff. A friend calls it ironic photography. Bon Appetit! Don't break a tooth on a hubcap. 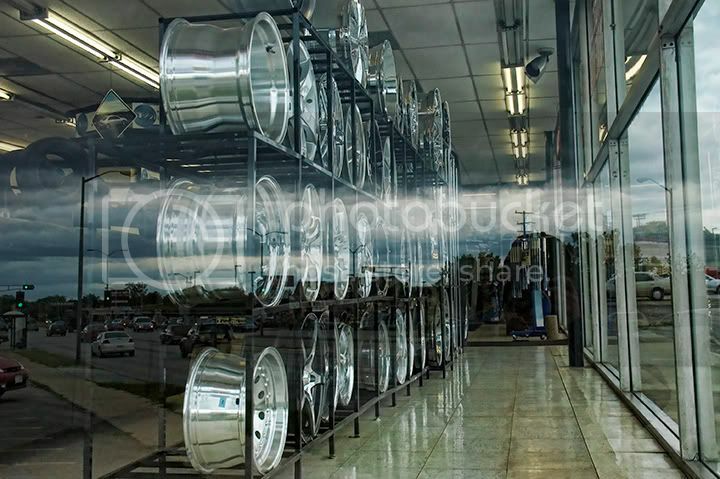 Labels: "Boston Market", "Jeff Blackwell", "Jeffery Blackwell Photograhy", "Jeffery Blackwell", "truck graphics"
I was driving up Highway 100 in Brookfield, Wisconsin when I passed F&F Tire. 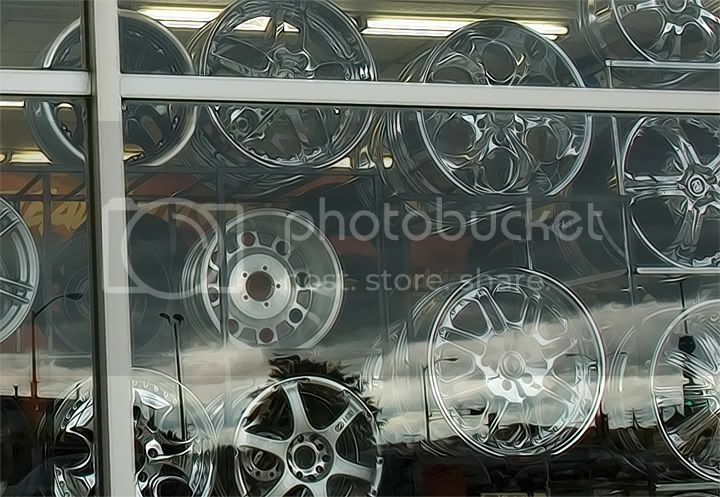 This stunning display of chrome wheels glittered in the cool gray landscape and the store window reflected the low clouds that were trying to look threatening. The reflections within reflections and the wonderful variety of wheel patterns demanded that I turn around… wait what seemed like 10 minutes at the red light again… and go back to make some pictures. 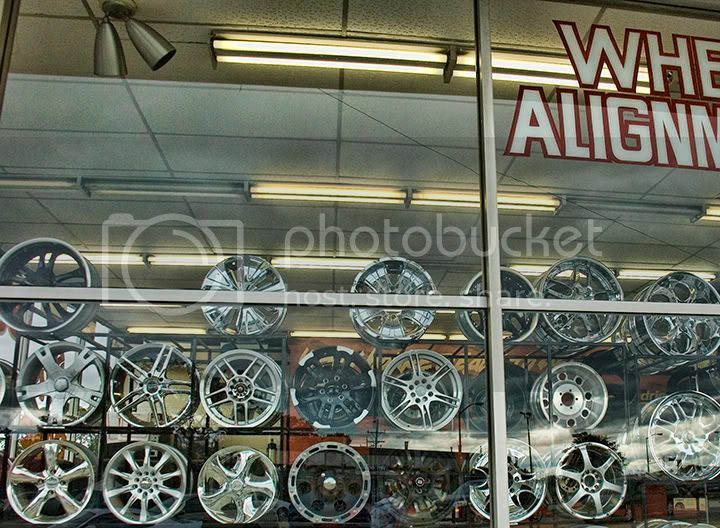 The wheel, of course makes the car possible. As such, every single car ever produced has had at least three of them, and four is the magic number that provides optimal control and stability. 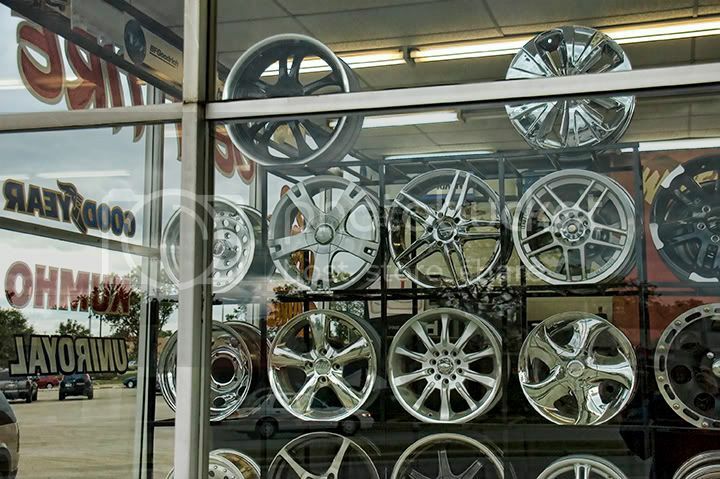 So one might expect that the car wheel would have become standardized over the century or so of production. That will never happen. 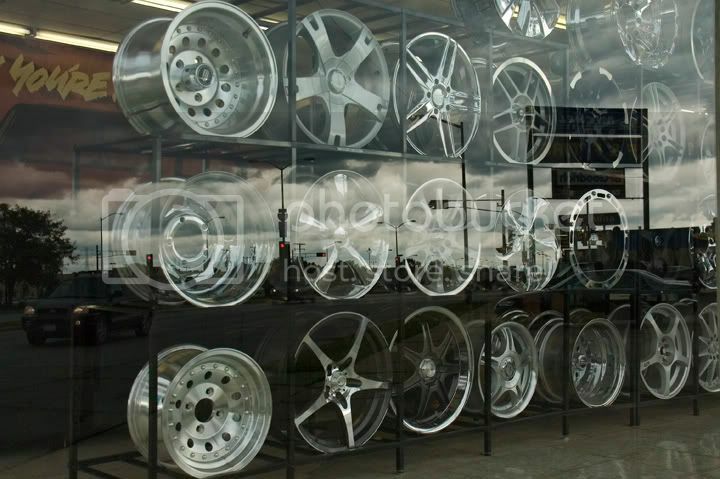 The fact is that wheels are the most common way to personalize a car. They draw a viewer’s eye like no other part of the car. And, they are easily changed. For these reasons, there are a seemingly infinite number of variations in the available space between the hub and the rim. I really became a bit entranced staring into this display. There are so many levels and layers to these images that they remind me of multiple exposures, showing one scene superimposed on another. I tried converting some of these images to black and white, and while they would make beautiful silvery prints that way, on the screen the subtle casts and brilliant points of color add another dimension to the pictures. As I usually do when I am visiting my father-in-law Doc's place in western Illinois, I got out early and went looking for interesting vehicles. Like a slowly rising tide, the season's corn crop has begun to swallow the human-sized features of the Illinois landscape, leaving the tops of trees and buildings bobbing in the waves of sparkling green leaves. It's been a rainy Spring, and the dead straight roads that slice the flat fields are already becoming walled in by King Corn. The freshly sprayed number on the wagon's front door caught my eye as I passed through the intersection, catching a glimpse down the side road. Otherwise I would have assumed this was just a dead Volvo, fortunate enough to have turned it's final rev in the shade of the big Maple tree. Was that a race car or a wreck? I circled back and as I rolled up I noticed the absence of windshield glass and the square-foot-sized hole cut in the in the middle of the hood. 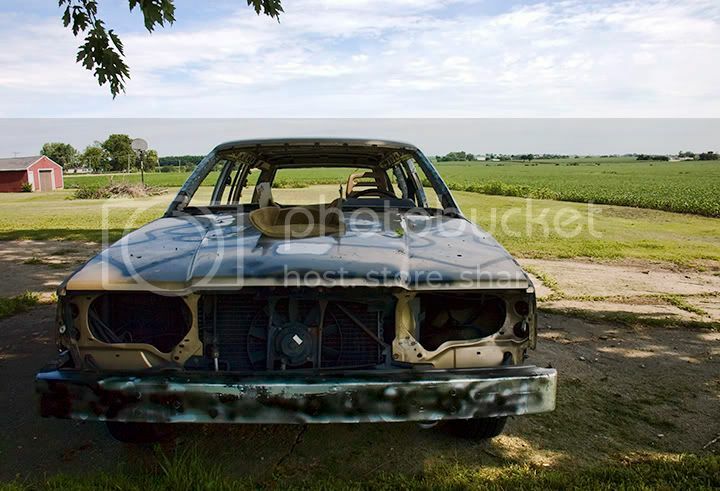 County Fair time is upon us, and the demolition derby season is underway. As I was getting out of my car, John swung open the back door of his house and stepped out into sunshine. I raised my hand and he waved back. As we approached each other I asked him if it would be OK for me to make some pictures of his cars. "Go right ahead," John said after I introduced myself. "They're my son's cars. They're just about ready to run in the Derby." 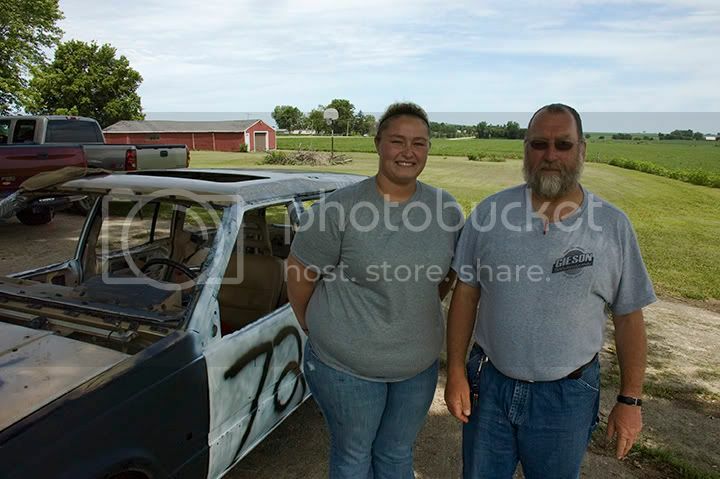 John's son Chris and his fiance Cassie decided to build themselves a pair of derby cars a few weeks ago, and are very excited to drive their first event at the Lee County fair later this month. As John and I were discussing the fine points of building a car to withstand repeated ramming by other cars, Cassie drove up. She told us she had brought some paint to put the finishing touches on her car. "Pink?" asked John, without any hint of irony. "I don't like pink," Cassie said, producing a spray can of blue metallic, which she began to apply. 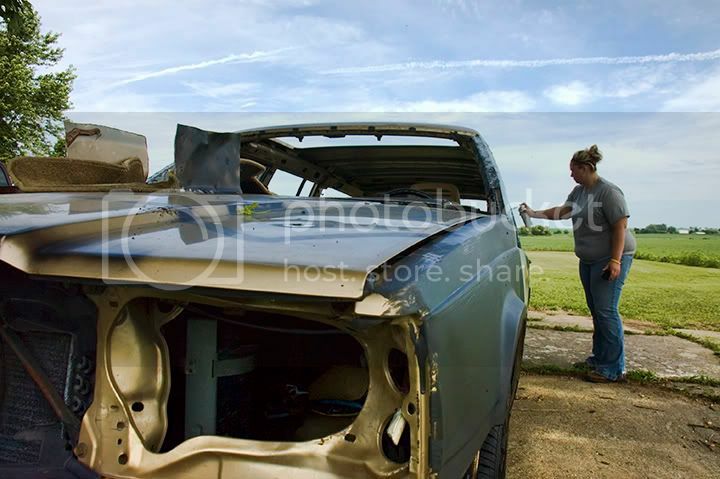 After a trip around the car with the blue paint, Cassie stood back to look at her work. She looked at me. "You wanna hear it? It sounds bad." 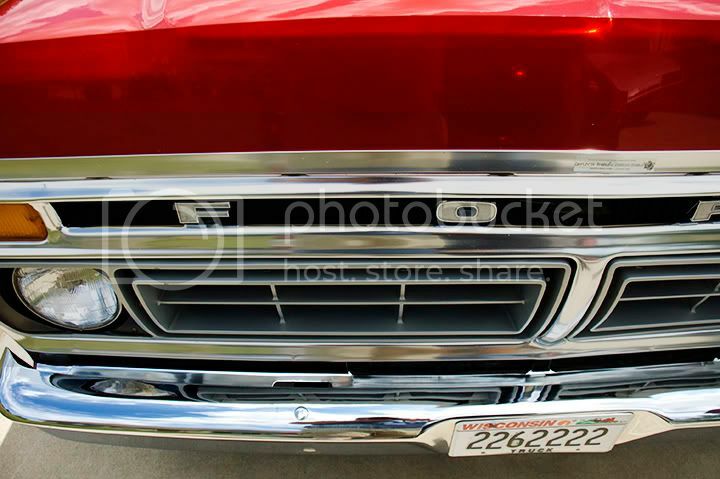 She reached in through the passenger side window, connected the battery, and fired up the old Volvo, which had been shorn of most of its exhaust system. 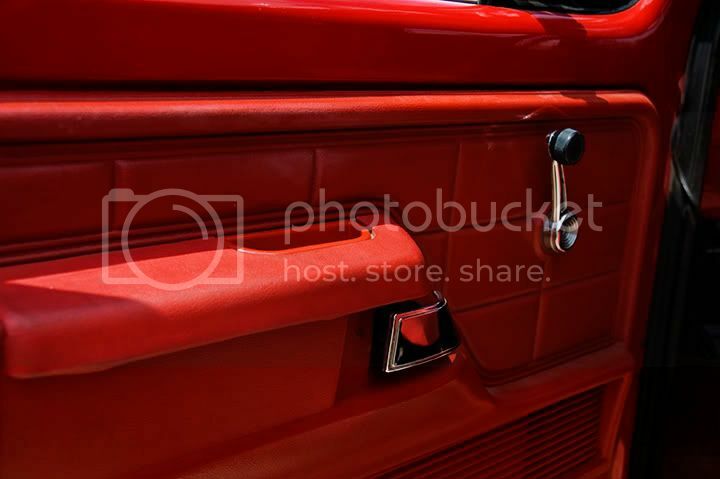 This particular red pickup truck may be the quintessential internal-combustion powered American vehicle of all time. 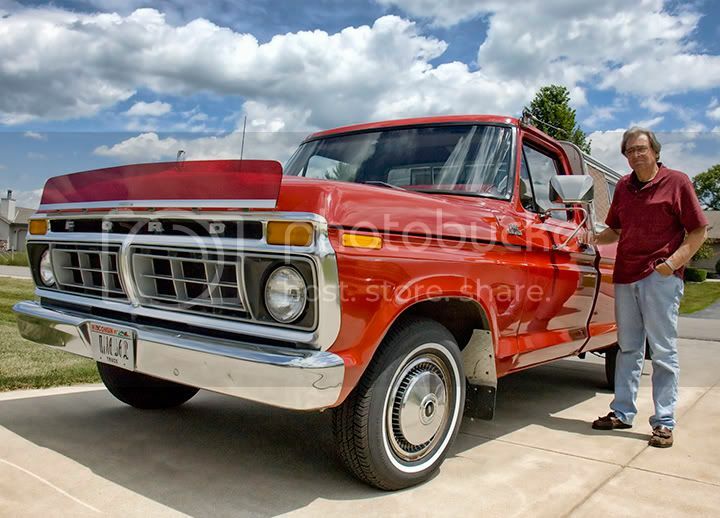 It is a 1977 vintage Ford F100 owned by Ray, the gentleman in the picture. I loved this truck so much when I saw Ray driving it that I followed him for almost 10 miles so I could make these photos. I was a couple hundred yards behind Ray in traffic when I spotted the white painted bumper and the really skinny tires on Ray's truck. 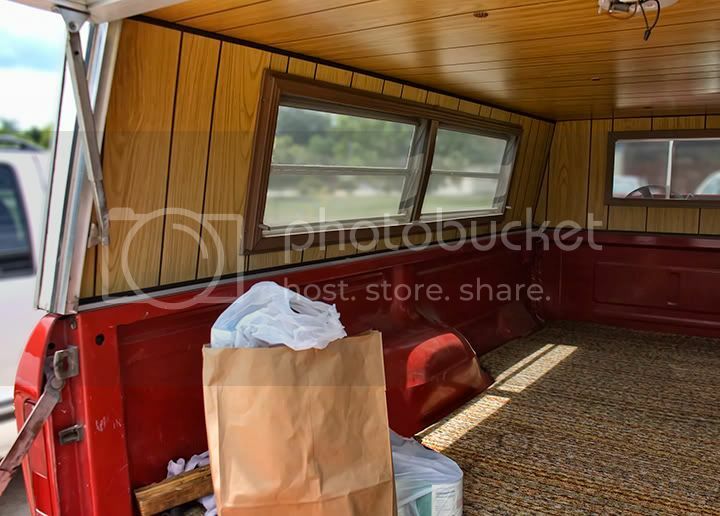 When I pulled up next to him at a light and rolled past the camper/cap with brown embossed vinyl panels on the sides and wood paneled interior, I recognized it as a classic example of the American pickup truck. Ray's truck is in beautiful, original condition. Introduced in 1948, the F series was born a cash cow for the Ford Motor Company and remains so to this day. It was the best-selling vehicle in the United States for 23 years, and has been the best-selling truck for 31 years. Ford has sold some 32,000,000 instances of the F-Series pickups. I say that this might just be the quintessential vehicle because Ray has used his pickup for nothing more than personal transportation and hauling that proverbial 4x8 sheet of plywood. The bed is even wood-paneled and carpeted – just like my family’s rec room. 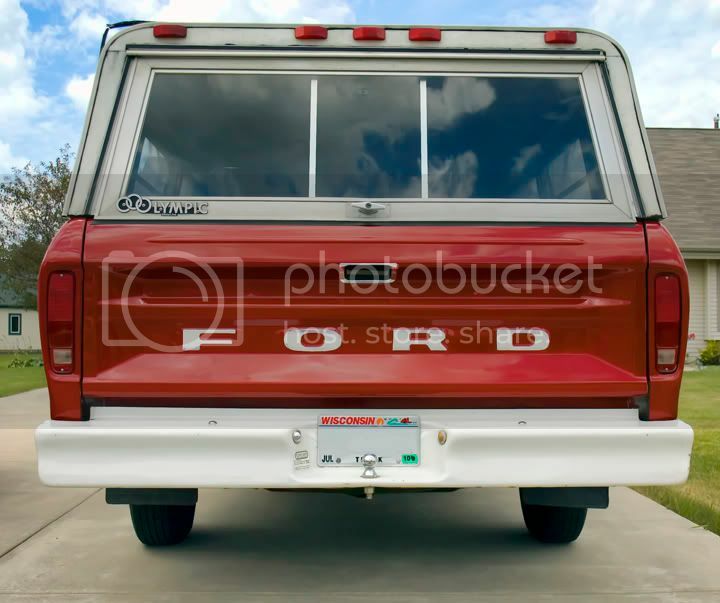 In this way, Ray was astride the wave of Americans who discovered that the high riding position of a pickup gave one a feeling of security and power which they absolutely loved. They were even willing to trade passenger capacity (2-3 vs. 5-6 for a “family” car”) for the experience. The 8’ bed was seldom used, but eminently useful when it was. Of course the "pickup" truck now commonly seats four (at the expense of the 8’ bed) and it wasn’t until 1984 that the Jeep Cherokee mutated into what we now call an SUV – a “family truck”. As you can see, Ray’s truck is quite free of scratches, and it hibernates away the long Wisconsin winters in Ray’s garage. 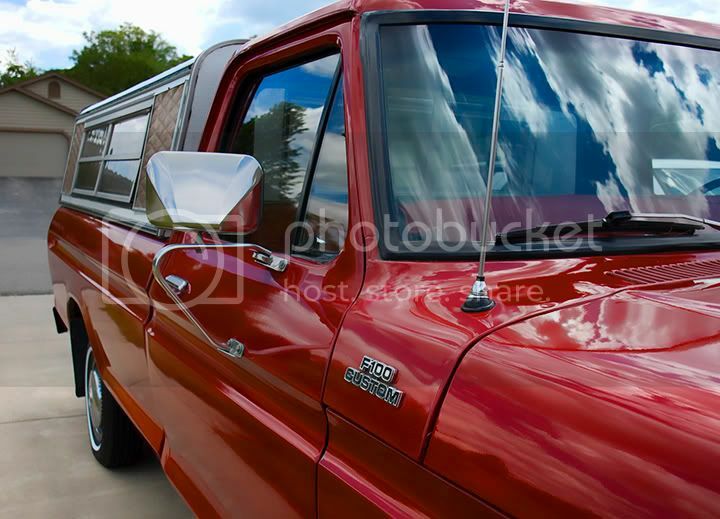 Ray bought his truck in 1978, when it had less than 10,000 miles on it. 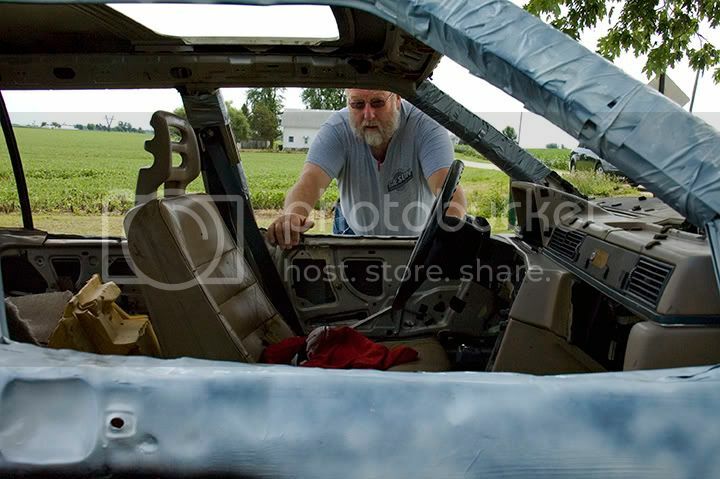 He has driven it just about 100,000 miles since then, and does all his own maintenance, which he describes as “not much”. 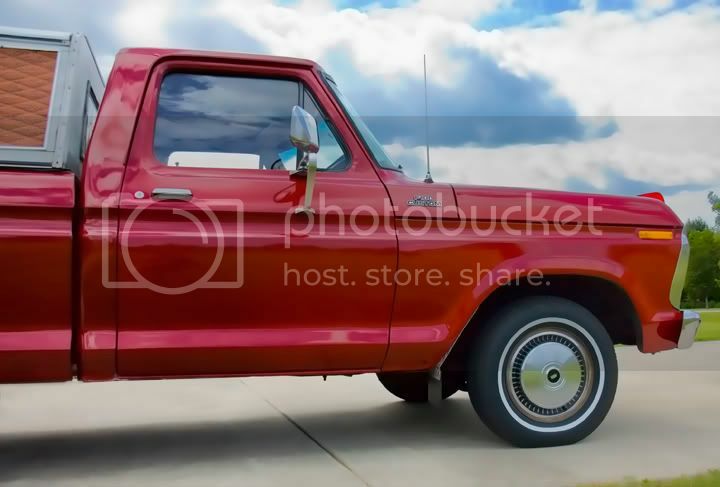 Ray’s F100 has a “three-in-the-tree” (three speed stick shift on the steering column), crank windows, a vinyl bench seat, no power brakes or steering and no air conditioning. The way a truck should be.